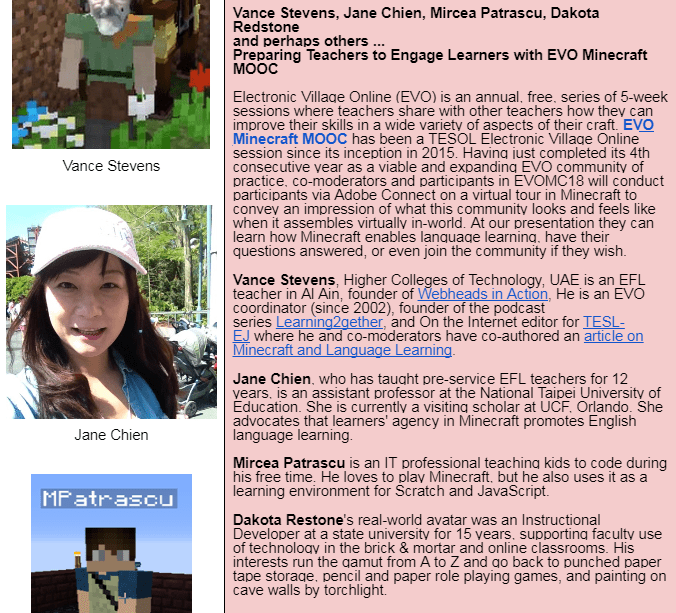 Electronic Village Online (EVO) is an annual, free, series of 5-week sessions where teachers share with other teachers how they can improve their skills in a wide variety of aspects of their craft. 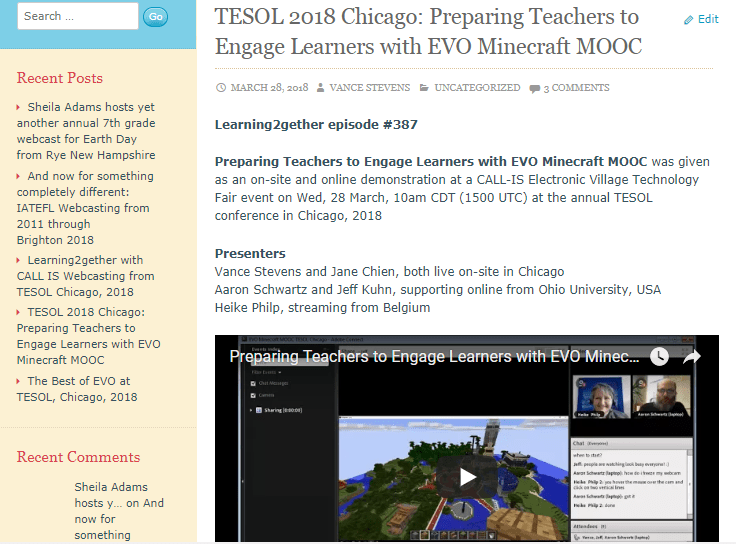 EVO Minecraft MOOC has been a TESOL Electronic Village Online session since its inception in 2015. 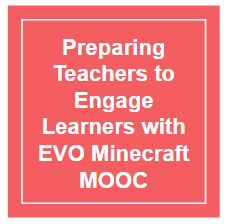 Having just completed its 4th consecutive year as a viable and expanding EVO community of practice, co-moderators and participants in EVOMC18 will conduct participants via Adobe Connect on a virtual tour in Minecraft to convey an impression of what this community looks and feels like when it assembles virtually in-world. At our presentation they can learn how Minecraft enables language learning, have their questions answered, or even join the community if they wish. Watch the tour and join the conversation in the Adobe Connect Room: http://lancelot.adobeconnect.com/virtual-round-table. Vance Stevens, Jane Chien, Mircea Patrascu, Dakotah Redstone, etc. We will be warping and teleporting to various interesting sites on our Minecraft server. 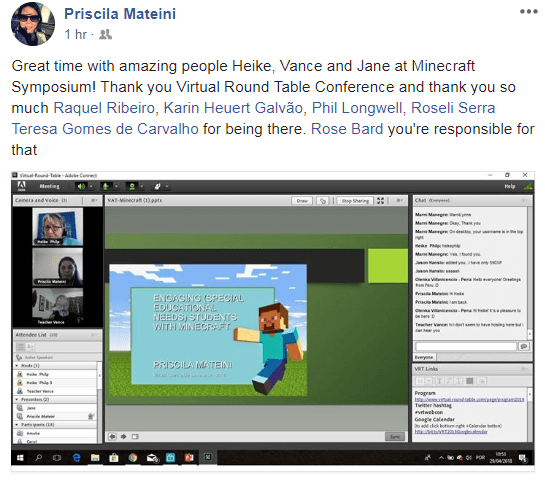 During the event, you can join us in Minecraft if you are whitelisted there, or watch the tour and chat with us at the Adobe presentation venue, http://lancelot.adobeconnect.com/virtual-round-table; or you can watch the livestream on https://www.youtube.com/user/letstalkonlinedotcom/live. Our presentation is followed at 15:30 UTC by a Workshop on How to build in Minecraft. It’s free but places are limited, so you need to register at http://vrtwebcon2018.eventbrite.com. You need to have a Mojang login to participate hands-on at the mc.guinevereproject.eu server. 335 participants enjoyed three days of presentations, keynotes, workshops, addathons, hackathons and more. All of the recordings have been published on the program and in form of individual session blogs here. I am especially proud of the result of the Addathon where participants and presenters of the VRT collaboratively shared their know-how on tools. The Addathon lists approx. 100 tools for language learning including a short description on what it is, how to use it and perhaps some examples. This list is AWESOME!!!! to say the least and exceeded my expectations by a large margin. Many many thanks to all who shared their know-how, presenters as well as participants of the VRT. May we thank all of the presenters and our wonderful moderators Angelika, Božica, Helena, Oksana, Scott and Syke. We will join the GUINEVERE Minecraft Server which currently is still open as we are developing it. Therefore you do not need to sign up anywhere just add the mc.guinevereproject.eu to the servers and enter. The 10th Virtual Round Table Web Conference took place on 27-29 of April 2018 together with the 9th vLanguages Annual Symposium in Second Life (formerly known as SLanguages). The Virtual Round Table is a community event and focuses on language learning technologies. It is independent, a grass root event and free for all to attend. This unique web conference is supported by a great group of leaders in specialised fields who are willingly to donate their time as symposium coordinators or moderators. In case the capacity of the room has been reached, you can watch the livestream. Come join three days of networking and great talks, workshops, addathons, hackathons, virtual worlds and more starting today, Friday 27 April at 11am GMT. 11:00am GMT KEYNOTE Thomas Strasser: Smartphones are not the answer?! Today we look forward to a full day of learning at the 10th Virtual Round Table WebCon/ 9th vLanguages Annual Symposium. Starting at 9am GMT we look forward to Joe Dale’s keynotes (9am) and his 1001 tips on how to create learning material with a few clicks. Are you interested in virtual worlds, Minecraft and other virtual environments? Then do not miss the GUINEVERE Symposium (2pm) about games in virtual worlds and the vLanguages Symposium (10:30am) when Helena will introduce you to the games she developed and David talks about his successful English program in Second Life. Equally exciting is the Sinespace Symposium (5:30pm), because this is a new virtual world which rocks. Not really into 3D environments? Then perhaps Maria’s exciting presentation about how she uses Skype to connect to other educators around the globe and Kashif’s impressive case study. Did you know that 98% of Oman(ians) have a university degree? You will learn more about how Oman invests heavily in education. And we will start our HACKATHON (10am) continue to work on the ADDATHON (12:30pm). Curious? So are we of how you develop this. Audience participation is required. Day 3 of the 10th Virtual Round Table Web Conference/ 9th vLanguages Annual Symposium holds a few surprises for us in store. 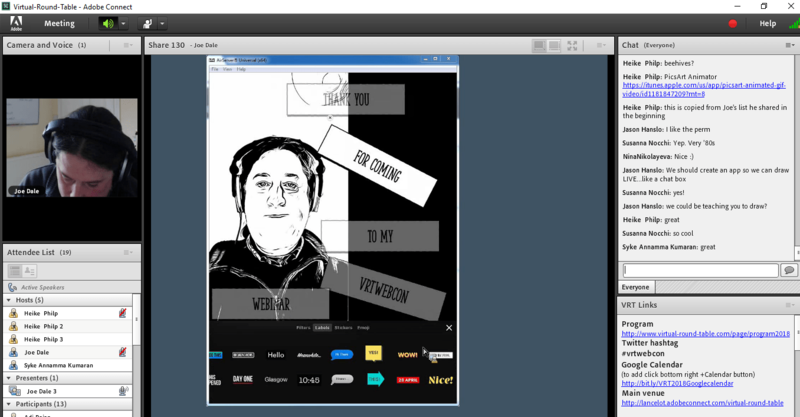 It is the last day of a VRTWebcon which has been more virtual than ever before. We start today, Sunday 29 April at 12pm GMT/ 1pm UK time with Jean-Paul DuQuette who presents his dissertation about language learning in Second Life. 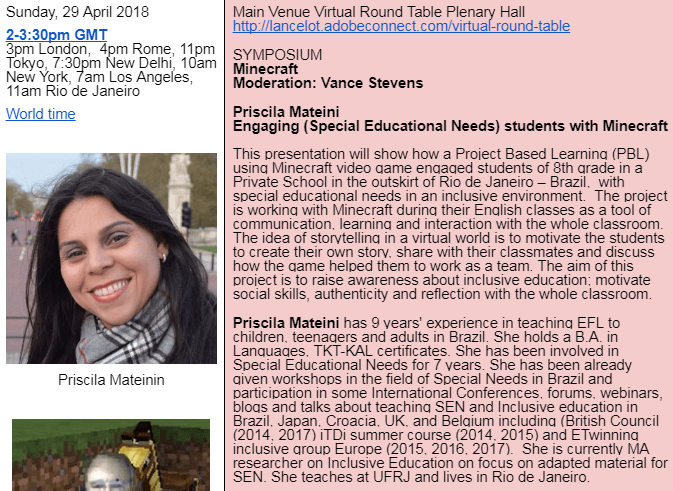 Then, at 2pm GMT/ 3pm UK time there will be a Minecraft Symposium by Vance Stevens, Jane Chien and Priscila Mateini on using Minecraft for Special Educational Needs students and children in school. This will be followed by a Minecraft workshop conducted by Carol Rainbow within the framework of EU funded GUINEVERE project. 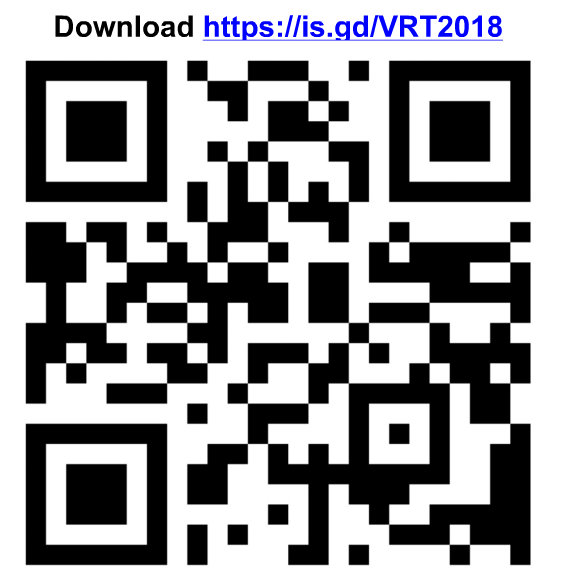 The day will conclude at 5pm GMT with a repeat of the PCE (pre conference event) on Altered Reality by IATEFL LTSIG (LearningTechnologies Special Interest Group) and we look forward to Sarah Rogerson’s fabulous presentation and Raquel Ribero’s practical tips on how to use VR in class. Keep a cardboard at hand! Me, myself and I, Heike Philp will also redo my presentation at the LTSIG on “Back to the Future: From virtual worlds to virtual reality”. Last but not least we welcome as a special guest Öznür and Ege, who demonstrate to us the VR game which won the Goethe Hackathon in Istanbul, a game the team of four developed in a matter of 3 days. 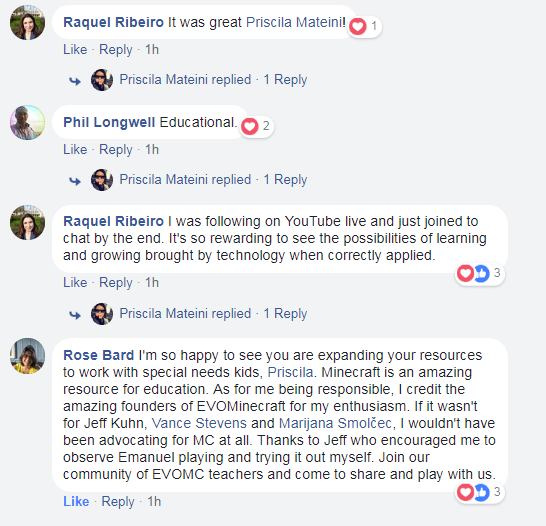 Then, at 2pm GMT/ 3pm UK time there will be a Minecraft Symposium by Vance Stevens, Jane Chien (showing their work in EVO Minecraft MOOC) and Priscila Mateini (on using Minecraft for Special Educational Needs students and children in school). This will be followed by a Minecraft workshop conducted by Carol Rainbow within the framework of EU funded GUINEVERE project.